Have questions? 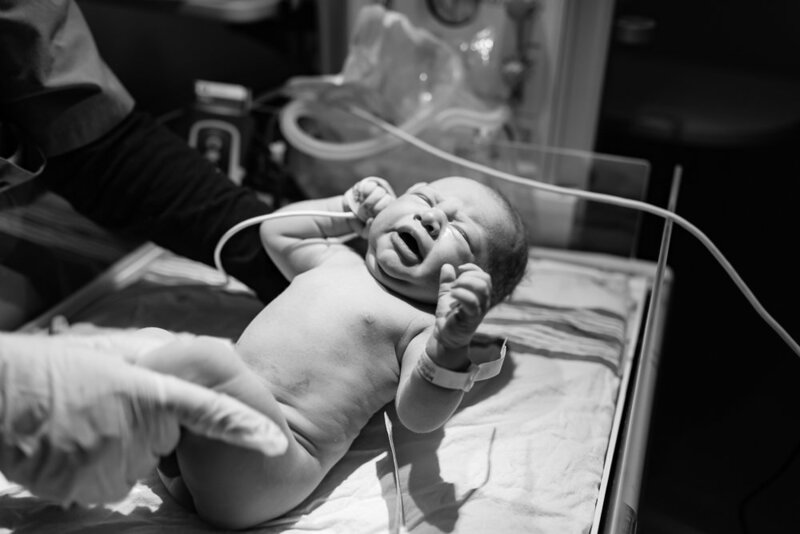 Here are some of the most common questions about birth photography. +When do you go on call, and what does that mean? My on call period begins at 37 weeks, and this means that my bags are packed and ready to go by my front door, I don't go out of town during the on call period, and I don't make any plans that can't quickly and easily be changed or cancelled. Ask anyone what the most important and memorable days of their lives are, and chances are they will tell you the day they met their significant other, their wedding, and the birth of their children. Its an incredibly beautiful and empowering experience. I want to capture that power and emotion for you, leaving you and your family free to be in the moment, and to have something beautiful to look back on. I know that without photos from the birth of my son, I wouldn't remember certain aspects of it. +Can't my family/Doula take photos for me? Sure. But know that births are often a low light, chaotic scenario, and can be very technically challenging to photograph. Most times, a camera on Auto won't cut it. I want to give you beautiful images, and allow your family/doula to be fully present, and focus 100% on you and that beautiful baby that is coming to this world. +When should I book with you? Because of the unpredictable nature of birth, I can only schedule a very limited number of births per month to give my clients the best attention I can. Please keep this in mind and reserve your birth photographer as early as possible! +When do you arrive for the birth and how long will you stay? We will talk about this during our prenatal visit in greater detail but basically you can expect me to come when you are in active labor (5-6 cm dilated). I know some women have their babies very fast (my daughter was born in two hours start to finish), if you know this is how your body works we will work out a plan that works best for you. On average, I stay one to two hours after the birth of your baby. If your baby needs medical assistance after they are born and I am unable to capture family bonding images, I will come back when your family is ready to document those moments. +What if I have a c-section? If you have a c-section or have a scheduled c-section, you will receive beautiful photographs. Even if I am not allowed in the operating room, I will be there waiting as soon as you are in a postpartum room. Be sure to check your hospital’s policy on who is allowed in the OR. +Will I be able to show these pictures to not-so-close friends and relatives? Each birth can be captured as modestly as you like. Some moms want only shots taken near her head while others want images of their baby crowning; it is completely up to you. If you aren’t sure I can put some in a file clearly marked so you can decide when and if you want to see those images. +What if I don’t make it in time for the birth? This is unlikely but still a possibility. I require that I am notified with 60 min time to arrive at the birth, although I am usually there much faster. I expect that you keep me as informed as your care provider. Even if you don't think it's time for me to come, letting me know that you're in early labor will help me plan to be able to arrive as soon as needed. If I am not informed with enough time to get the actual birth, I will still photograph after birth and stay for a minimum 2 hrs. If by some unusual circumstances (roads closed, extreme weather, etc), I cannot get there in time, I will photograph after the birth or a fresh 48 session in the hospital the following day. If I personally have some unusual circumstances that I cannot get there, I will send my backup photographer who is equally professional. If neither I or my backup make it for the birth, we will discuss options for refund or fresh 48 session. +When should I call you? Call me as soon as you think something is happening. I understand false alarms happen and that is part of the birth and you should never feel silly about not knowing for sure. Call me, text me, email me – whatever works for you but keep me posted. A good rule is that anytime you call your doctor or midwife to see what they think you should also call me. I also like to receive updates from your prenatal appointments as we get closer. +Do you use a flash? Each birth is completely different and it depends on what light is in the room. Often times, flash is unnecessary. On occasion, I do use flash, but I use professional equipment and the light is bounced of ceilings and walls, not in your face. Most moms don't notice the flash, and we can talk more about this at your pre-natal consult. A payment of 50% is due when you book your birth photography. The remainder is due three weeks prior to your estimated due date. If this is difficult for you let me know and we can work out a payment plan. I also offer my clients gift registries. +Do you offer gift cards? Yes! What a wonderful gift to recieve from loved ones. Gift cards are available here.